Meet a successful woman in STEM working as a veterinarian. Meet the third woman featured in Fastweb’s Women in STEM series. We caught up with Casey Kersten, another successful woman in STEM to ask her questions about her studies, what it’s like to be a veterinarian and to learn a little more about the path she took to get there. 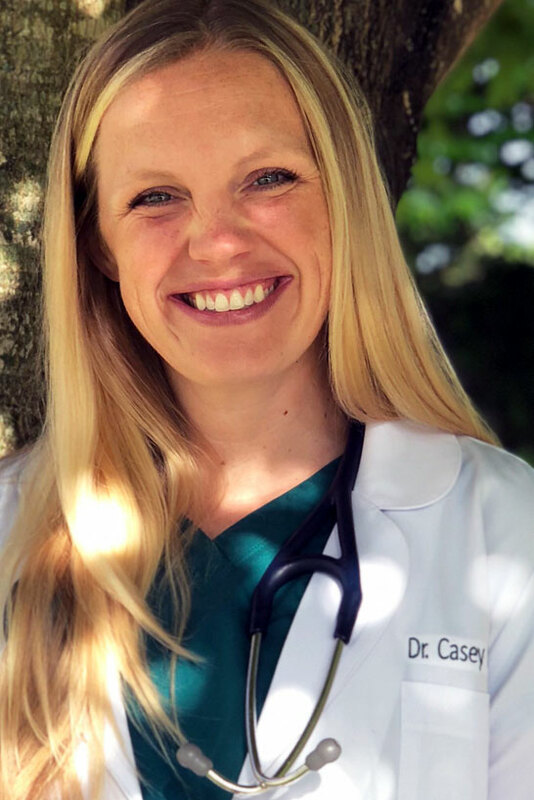 Casey is a Doctor of Veterinary Medicine at Avery Creek Pet Hospital, located in Asheville, North Carolina. We learned that Casey was introduced to the STEM world at an early age. Growing up, she has plenty of role models in STEM careers and was exposed to medical fields. She shared a bit of her background with us so we could gain insight on what originally sparked her interest in STEM-related careers below. “My grandpa, father, and brother were all dentists so medicine-based careers were all I really knew or understood. I grew up visiting my dad’s office for “Take Your Daughter to Work Day,” performing science experiments in my backyard, breeding leopard geckos, and attending Space Camp. I was confident in who I was and what I enjoyed, even if it wasn’t completely mainstream. I was great at math but didn’t really love it and loved science but wasn’t always great at it! There is such variety in science classes; I struggled with some and excelled in others. When I was trying to determine my undergraduate major, I remember telling my dad that I thought I wanted to be a veterinarian or a dentist but I wasn’t sure if I could handle all the science courses. He gave me advice that I will always appreciate- you aren’t always going to love your classes, but in the grand scheme of things your education is just a blink compared to your lifetime career. If you know you will enjoy going to work every day in a certain career then you do it! Fast forward 15 years and I can honestly say that I wake up every morning looking forward to going to work as a veterinarian.” Note: Casey Kersten is our third woman in STEM highlight within our Women in STEM series. You can find the first highlighted woman in STEM here and the second highlighted woman in STEM here. Read on to learn more about Casey and her STEM career via her Q&A with Fastweb. 1. What’s your education background? I obtained a Bachelor of Arts from Miami University with a zoology major and a French minor. I then returned to my home state of Michigan to attend Michigan State University’s College of Veterinary Medicine and graduated in 2011. MSU has one of the top veterinary schools in the country and I am very proud to say that I am a Spartan vet! 2. Did you apply for and/or obtain any scholarships? I applied for and obtained a small scholarship for my undergraduate studies through my local church. I applied for several scholarships in veterinary school but unfortunately did not receive any. I certainly wish that I had known about college scholarships for women in STEM and STEM field college scholarships and internships such as those presented through Fastweb. As a college student, money was “something I’ll figure out later, I just want to achieve my dreams!” Now, as a real life working adult swimming in school debt, I definitely regret not investigating my financial options more thoroughly. 3. Did you have any internships? If so, what did you learn from them? Getting into veterinary school is extremely competitive. If you want to stand out as an applicant you have to fill your years leading up to applications with a wide range of experiences that will demonstrate your commitment and show what makes you unique. There are plenty of internships and fellowships for women in STEM that can help you gain that vital experience within your chosen field. While most of my friends spent their college summers working to earn some cash for the next school year, I volunteered for veterinarians full-time every summer. A paid internship in a veterinary related field would probably have made more sense, but let’s remember my definition of money from question two. I certainly spent a lot of time volunteering in small animal clinics (cats and dogs), but I knew that if I wanted to stand a chance at getting into vet school I would need to branch out. I found a local equine (horse) veterinary clinic and convinced them to take a chance on a wide-eyed 19-year-old who knew NOTHING about equine medicine. I soon found myself spending a few days a week driving around to farms and assisting the veterinarians in wild, fascinating, and often downright dangerous situations in the name of equine medicine. I was hooked! Once I got the ball rolling I wanted my hands in everything. I got a job in Miami University’s Zoology department helping a graduate student perform research on the habitat patterns of white-footed field mice. I sought out opportunities with mixed animal vets (think sheep, alpacas, etc. ), which led to more great stories around the dinner table each night. These summer experiences taught me so much, but mostly that if you see something that interests you that you want to try, ASK! From what I’ve seen and experienced, most professionals are more than happy to show their career world to a young person trying to figure out their future. These realizations led me to even more experiences in veterinary school that I probably wouldn’t have had the guts to pursue otherwise. I worked on rhinoceroses, giraffes, and wildebeests in South Africa on a trip for veterinary students that forever changed my life. I vaccinated and dewormed hundreds of animals in Honduras on a mission trip with my classmates. My special interest in veterinary dentistry led me to seek out three different three-week externships with some of the world’s leaders in the field. These were names that I still commonly see in textbooks and journal articles and that I greatly respect, and they each took me under their wings for several weeks simply because I reached out and asked. 4. How would you describe your current job in layman’s terms? What does a typical work day look like for you? My first job out of school was at a fantastic small animal practice in my hometown. I was doing what most people would imagine a veterinarian would do: seeing appointments all day and performing surgery and dentistry a few half-days per week. It was a great experience, but when my husband’s job relocated us I decided to look into different kinds of jobs as a veterinarian. There are a surprising number of pathways you can take in your career as a vet. Veterinarians can work in public health, in the research fields, for the government, in shelter medicine, in zoos or wildlife fields…the list truly goes on and on. I knew that what I loved most about veterinary medicine was performing surgery and dentistry (must have been all those “Take Your Daughter to Work Days”), but I assumed the only way to do exclusively that would involve pursuing several more years of residency to become a specialist (impossible with my family situation). Ultimately I decided to take my own advice and just start asking, and lo and behold a wonderful veterinary hospital was actually looking for someone to perform exclusively surgery and dentistry. I have been there for almost three years now and couldn’t be happier. My typical day starts with two or three cats or dogs on my surgery schedule. I would say about 70% of what I do is dentistry, which includes anesthetizing the animal, taking full-mouth radiographs, probing and charting the mouth, scaling and polishing the teeth (performed by my awesome veterinary technicians and assistants), and performing any extractions or other necessary advanced procedures. I also perform lots of spays, neuters, mass removals, soft tissue surgeries, etc. I have always had an affinity for STEM subjects, but I am drawn to the arts as well. Surgery and dentistry are truly a combination of both. Every day is different and brings new challenges and rewards. The best part about my job is the very real difference you can make in an animal’s quality of life. A response I commonly hear from clients about a week after their dog or cat’s dental problems have been addressed is that their pet is suddenly acting like a puppy or kitten again and that they hadn’t even known anything was wrong. If you’ve ever had a sore tooth you can imagine what it might be like for these animals to just live with chronic pain and infection and then to suddenly feel normal again. It is an incredibly rewarding job! 6. What advice do you have for students going into STEM fields? If you know that your interests fall into STEM fields, own it! Don’t be afraid to be who you are and like what you like. In college when my friends were coming back from their various class presentations in their business casual outfits, I was coming home from my mouse field research wearing steel-toed boots covered in mouse poop with a big smile on my face. I embraced my differences and never looked back; don’t be afraid to do that! 7. What specific advice do you have for females going into the field? Veterinary medicine was a male-dominated profession for many years. The shift began in the 1970s after the passage of Title IX, the federal amendment that prohibits discrimination against female students. Since then there has been quite a reversal of the male versus female ratios in veterinary schools. For example, my class of 117 students only had 13 men! So really, if you are a female considering working in veterinary medicine you will actually be in the majority now! Overall, we definitely need more women going into the STEM fields though and I would absolutely encourage female (and male) students to pursue it if that is where you passions lie. These are exciting times, where women are finally getting the respect and opportunities we deserve so whatever your dream is, get out there and make it happen. 8. What qualities should students thinking about pursuing a STEM career have in order to be successful? Perseverance - There will be obstacles and failures and shut doors. Just keep moving forward! Passion - Find what you love and pursue it wholeheartedly. 9. What’s it like being a successful woman in a male-dominated field? Any advice? Although there are now plenty of women in my field, I have still felt the occasional wariness from some new clients upon seeing a young female as the person that is about to have their beloved pet’s life in their hands. In my early years I was asked several times, “Have you done this before? How many times?” These were questions that my male classmates just didn’t seem to get very often. I learned quickly that, in order to show them that their pet was safe with me, I needed to put in the extra work to hone my skills and stay current on the discoveries in my field. With experience and knowledge comes confidence and that is a vital skill in any demanding profession, for males and especially for females. 10. What do you think the solution is to get more females in STEM fields? First, to show by example that it can be done. Having strong and involved mentors will help guide the way. I would also like to add that I’m sure there are a lot of young women out there who like me, knew that they wanted to have a family someday and were concerned about the demands of an intense job like the STEM fields can offer with balancing a family. Many of my close friends and I are living proof that it is VERY possible to do both. I have three young children that love hearing about what kinds of animals I worked on that day. My hope is that as more women enter the STEM fields they will be valued to a point where the work/family balance can become even more feasible. 11. Anything else we haven’t touched on that you’d like to include? If you are having trouble deciding which direction to take in your career path, I really gained a lot of insight from the book What Color is Your Parachute by Richard Nelson Bolles. The book helps you determine what your skills are and what you enjoy the most, which often coincide. It is the reason I realized that I would be happiest in my career if I were exclusively performing surgery and dentistry, which led me to the very fulfilling job I now hold. I am so grateful to my parents, my husband and kids, and my colleagues and work family for their support in my journey. If you have a question for our featured woman in STEM, Casey Kersten, send an email to ask Casey your question today.